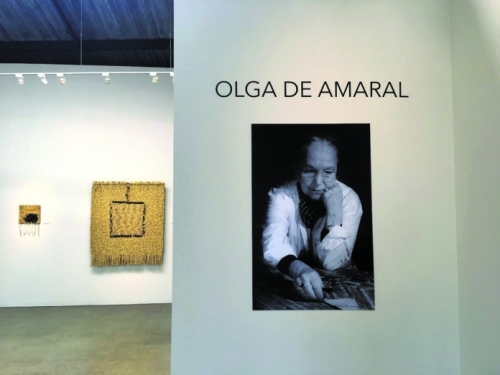 The Latin American Masters Gallery in Unit E2 of Bergamot Station will be exhibiting works by artist Olga de Amaral through Oct. 10. Her works, which were created for the exhibit, combine textiles, acrylics and paint into multimedia tapestries that don’t fit into a neat categorization. Stephanie G. Mercado, the gallery’s assistant director, explained that Amaral’s works reference the type of Precolonial work on display in the Getty exhibit in their golden color, textile material, as well as in reflecting some of their shapes. “With Amaral’s work, like a lot of the artists we exhibit, there’s a lot of reference to the Precolumbian,” Mercado said, referring to art created in South America before the influence of European colonists. Gallery Director William J. Sheehy explained that the gallery had been aware of Amaral’s works for years before reaching out to her through a mutual contact. They first exhibited her works in a 2012 exhibit, making this the second time her works have been shown at the gallery. Amaral’s quasi-textile works were exhibited in the New York MOMA in 1968 in their painting galleries, which was near the beginning of her long and experimental career. Regarding this exhibit’s works, Sheehy elaborated particularly on her chosen materials, and the strong presence of gold in her works.